Property Owners: List your Lorraine property on the premier site specialising in French holiday lets. More Info. View all gites and villas in Lorraine. Lorraine is perfect for a gite holiday. For those who are unaccustomed to the type of accommodation, Lorraine gites are an excellent introduction. They are clean and comfortable, and maintained to a high standard. The same can be said of the villas, and whether you choose a gite or a Lorraine villa, you won’t be disappointed. Lorraine is an old historic province, the capital of which is Metz, one of the oldest cities in the country. As with most cities, there is always plenty to see, but be sure to take in the Cathedral St. Etienne, a gothic construction with a reputation for its stained glass. Metz also hosts what is allegedly the oldest church in France, Église St. Pierre aux Nonnains. Much newer is the Centre Pompidou, a museum devoted to contemporary and modern art. Lorraine is also the birthplace of Joan of Arc, and her village, Domrémy la Pucelle, can be found in the Vosges area, to the south of the region. 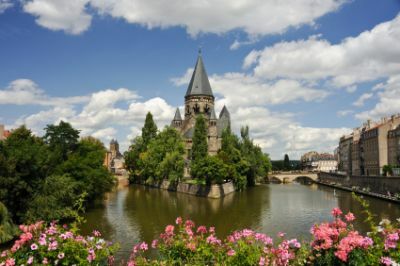 In the Moselle area, you can visit two fascinating museums; the mining museum in Neuchef, complete with an underground tour led by former miners, and the coal mining museum in Petite Rosselle, which involves a two-hour trip down into the depths of the earth. Also, while you’re in the Moselle area, visit Sarrebourg, a small town in the Vosges hills, where you can go for a ride on the Abreschviller Forest steam railway and marvel at the stunning scenery. Just like the neighbouring Alsace region, Lorraine cuisine is subject to German influences. The most famous dish to emerge from this region has to be Quiche Lorraine, but as wholesome as it is, not to look any further would seriously impair your holiday enjoyment. Lorraine shares one or two dishes with its Alsace neighbour, notably Coq ou Riesling and Choucroute Garnie, a casserole made of sauerkraut, pork and sausage. Cabbage, both white and red, is the most popular vegetable, and it’s often pickled, turning it into Choucroute, or flavoured with juniper berries. Freshwater fish is always available, with trout, carp and pike making the relatively short journey from the local streams and lakes to the dinner table. Of all the different varieties of fruit available in the region, if you’re there towards the end of August, be sure to have your fill of Mirabelle plums. They’re small and yellow, and a true delight. While they’re simply heaven to eat on their own, they’re to be found incorporated into jams and tarts, and sweet and savoury mixes that accompany duck or fish. The traditional Mirabelle Tart is a culinary experience to die for. While in Lorraine, also look out for Macarons de Nancy, also known as Macarons des Soeurs Macarons. Traditionally made from sugar, eggs, ground almonds and icing sugar, their very taste and texture defy the apparent simplicity of the recipe. And for a little something to nibble with your morning coffee or afternoon tea, dip into a plate of Madeleines. From the northern town of Commercy, these shell-shaped biscuits with a smooth texture have become THE classic snack of the region and, as such, it would be somewhat churlish not to partake.